Rachel Cusk’s Kudos: The Outline Trilogy Gets Its Third MasterpieceVoice and style — can they be separated? The auteurs of autofiction are all stylists and tension between style and voice is why we’ve flocked to them. The Good Place Pulled Off a Forking Great Twist EndingHoly shirt, that was mind-blowing. The Highs and Lows of the 2016 Golden GlobesMozart in the Jungle? Golden Globes 2016: Who Should Win the TV Categories?Cross your fingers. Who Would Benefit Most From a Golden Globe Win?Probably Casual. The Snubs and Surprises of the 2016 Golden Globe NominationsBig day for Netflix, Hulu, and Amazon. Small day for network. Los Angeles Film Critics Laud Spotlight, Mad MaxThe choices are entirely distinct from those made by the New York Critics Circle in major categories. Watch Timberlake’s Memphis HOF Induction SpeechJimmy Fallon introduced the new inductee. Emmys 2015: Who Should Win TV-Movie and Limited-Series Races?Olive Kitteridge, ladies and germs. Emmys 2015: Who Should Win in the Comedy Races?It’s time to give Kate McKinnon an Emmy. Is Jon Hamm Ever Going to Win an Emmy?He’s 0-14 going into Sunday. Curiosities and Tidbits From Today’s Emmy NominationsGood day to be Mel Brooks. Emmys 2015: Who Got Snubbed?The Americans, mostly. Try Our Oscar Acceptance-Speech GeneratorSay thank you! 5 Ways to Fix Those Horrible Red-Carpet ShowsYes to humor, no to body talk. Frozen Duo Writing a Song for Neil Patrick Harris to Sing at the OscarsSounds about right. SAG Awards 2015: The Complete Winners ListViola Davis and Uzo Aduba made SAG history. Here Are the 2015 Golden Globes WinnersFrom J.K. Simmons to Joanne Froggatt to Eddie Redmayne. Golden Globes: Who Should Win This WeekendIt’s the weird, silly awards show. Let’s have some fun. See Viola Davis’s Subtle NYT DigRemember when the Times said she wasn’t “classically beautiful”? The Snubs and Surprises of the 2015 Golden Globe NominationsWhat do the Golden Globes have against Mad Men? Los Angeles Film Critics Give Boyhood Top HonorsThere was a surprise Best Actor winner. Your 2015 Rock & Roll Hall of Fame Nominees: Green Day, Nine Inch Nails, N.W.A.You are old. Here Are the 2014 Creative Arts Emmy WinnersUzo, Allison Janney, and Bob’s Burgers all won. Young and the Restless Tops Daytime Emmy NomsPlus, some weird tidbits. Here Are the 2014 Tony NominationsNPH, yes. Denzel Washington, no. Scandal, Borgen, Orphan Black Win PeabodysCongratulations. True Detective Will Compete As Drama, Not MiniseriesFor this year’s Emmys. Watch Amy Poehler Praise Julia Louis-DreyfusAnd JLD’s charming acceptance speech. The Highs and Lows of the 2014 OscarsOy, the montages. So many montages. Gravity, 12 Years Top BAFTAsHere is the winners’ list. SAG Awards 2014: Your Complete Winners ListAmerican Hustle took the top honor. 12 Years a Slave, Gravity Top Critics’ Choice Awards12 Years a Slave took home Best Picture. Here are the 2014 Golden Globes WinnersKudos, actors and actresses. Chris Hemsworth Will Announce the Oscar NomineesThursday is soon! The Golden Globes: Who Should WinAnd whom to root for. Adele Gets a Fancy British Award, Makes Funny FacesFrom Prince Charles, too. Your 2014 Rock and Roll Hall of Fame Inductees: Nirvana, Peter Gabriel, Kiss…Nirvana! Peter Gabriel! Kiss! The 2014 Golden Globe Nominations Are Here!Big day. And This Year’s SAG Award Nominees Are …Everyone you’d expect! James Blake Wins the 2013 Mercury PrizeCongrats. Your 2014 Rock and Roll Hall of Fame Nominees Are …Nirvana! The Replacements! N.W.A.! 28-Year-Old Eleanor Catton Wins the Man Booker PrizeWe repeat: 28! Tina Fey and Amy Poehler Will Host the Next Two Golden GlobesYaaaaay. Alice Munro Wins Nobel Prize for LiteratureSorry, Murakami. Godspeed You! Black Emperor Won the Polaris PrizeThey seem sort of iffy on it. The 2013 Emmy WinnersHere’s a complete list of who won. 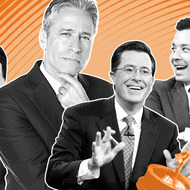 Emmys: Who Should Win in Late-Night and Reality?What’s a Colbert gotta do?